In this paper we report on limits related to the development of optical fibers with glass subwavelength inclusions incorporated into the core. We present the fabrication of a photonic crystal fiber made of an in-house developed silicate NC21 glass with a subwavelength-size high refractive index inclusion in the core made of lead silicate SF6 glass. The core has a diameter of 2 µm, while the diameter of the inclusion varies from 0 to 800 nm. Using energy-dispersive X-ray spectroscopy technique we show a dramatic change in the inclusion profile and its composition caused by a non-uniform diffusion of chemical molecules during the stack-and-draw fiber fabrication process. Therefore, the effective refractive index and the material dispersion of the final fiber are significantly different than for bulk glasses, which leads to an alteration of optical properties of the final fiber. A unique non-monotonic characteristic of the effective material dispersion is used to reproduce the fiber dispersion characteristic. K. Saitoh, N. Florous, and M. Koshiba, “Ultra-flattened chromatic dispersion controllability using a defected-core photonic crystal fiber with low confinement losses,” Opt. Express 13(21), 8365–8371 (2005). G. S. Wiederhecker, C. M. B. Cordeiro, F. Couny, F. Benabid, S. A. Maier, J. C. Knight, C. H. B. Cruz, and H. L. Fragnito, “Field enhancement within an optical fiber with a subwavelength air core,” Nat. Photonics 1(2), 115–118 (2007). B.-W. Liu, M.-L. Hu, X.-H. Fang, Y.-F. Li, L. Chai, C.-Y. Wang, W. Tong, J. Luo, A. A. Voronin, and A. M. Zheltikov, “Stabilized soliton self-frequency shift and 0.1- PHz sideband generation in a photonic-crystal fiber with an air-hole-modified core,” Opt. Express 16(19), 14987–14996 (2008). Y. Ruan, H. Ebendorff-Heidepriem, S. Afshar, and T. M. Monro, “Light confinement within nanoholes in nanostructured optical fibers,” Opt. Express 18(25), 26018–26026 (2010). F. Biancalana, T. X. Tran, S. Stark, M. A. Schmidt, and P. St. J. Russell, “Emergence of Geometrical Optical Nonlinearities in Photonic Crystal Fiber Nanowires,” Phys. Rev. Lett. 105(9), 093904 (2010). B. Kibler, P.-A. Lacourt, F. Courvoisier, and J. M. Dudley, “Soliton spectral tunnelling in photonic crystal fibre with sub-wavelength core defect,” Electron. Lett. 43(18), 967–968 (2007). T. G. Euser, M. A. Schmidt, N. Y. Joly, C. Gabriel, C. Marquardt, L. Y. Zang, M. Förtsch, P. Banzer, A. Brenn, D. Elser, M. Scharrer, G. Leuchs, and P. St. J. Russell, “Birefringence and dispersion of cylindrically polarized modes in nanobore photonic crystal fiber,” J. Opt. Soc. Am. B 28(1), 193–198 (2011). X. Yu, P. Shum, N. Q. Ngo, W. J. Tong, J. Luo, G. B. Ren, Y. D. Gong, and J. Q. Zhou, “Silica-Based Nanostructure Core Fiber,” IEEE Photonics Technol. Lett. 31, 1480–1482 (2007). 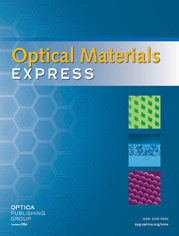 A. Wang, A. George, J. Liu, and J. Knight, “Highly birefringent lamellar core fiber,” Opt. Express 13(16), 5988–5993 (2005). K. Schuster, J. Kobelke, S. Grimm, A. Schwuchow, J. Kirchhof, H. Bartelt, A. Gebhardt, P. Leproux, V. Couderc, and W. Urbanczyk, “Microstructured fibers with highly nonlinear materials,” Opt. Quantum Electron. 39, 1057–1069 (2007). B. Ung and M. Skorobogatiy, “Chalcogenide microporous fibers for linear and nonlinear applications in the mid-infrared,” Opt. Express 18(8), 8647–8659 (2010). X. Zhang, X. Zhu, R. Xing, X. Yang, F. Jiang, H. Li, J. Peng, N. Dai, and J. Li, “Microstructure core photonic crystal fiber for blue extension of supercontinuum generation,” Opt. Commun. 298–299, 191–195 (2013). R. Buczynski, D. Pysz, R. Stepien, A. J. Waddie, I. Kujawa, R. Kasztelanic, M. Franczyk, and M. R. Taghizadeh, “Supercontinuum generation in photonic crystal fibers with nanoporous core made of soft glass,” Laser Phys. Lett. 8(6), 443–448 (2011). J. Pniewski, R. Kasztelanic, D. Pysz, R. Stepien, and R. Buczynski, “Supercontinuum generation in all-solid photonic crystal fibers with a low index subwavelength inclusion in the core,” Laser Phys. 23(8), 085104 (2013). G. Stępniewski, J. Pniewski, M. Klimczak, T. Martynkien, D. Pysz, R. Stępień, I. Kujawa, K. Borzycki, and R. Buczyński, “Broadband dispersion measurement of photonic crystal fibers with nanostructured core,” Opt. Quantum Electron. 47(3), 807–814 (2015). M. Koshiba and K. Saitoh, “Finite-element analysis of birefringence and dispersion properties in actual and idealized holey-fiber structures,” Appl. Opt. 42(31), 6267–6275 (2003). R. Buczynski, D. Pysz, R. Stepien, R. Kasztelanic, I. Kujawa, M. Franczyk, A. Filipkowski, A. J. Waddie, and M. R. Taghizadeh, “Dispersion management in nonlinear photonic crystal fibres with nanostructured core,” J. Eur. Opt. Soc. Rapid 6, 11038 (2011). R. Stepien, D. Pysz, I. Kujawa, and R. Buczynski, “Development of silicate and germanate glasses based on lead, bismuth and gallium oxides for midIR microstructured fibers and microoptical elements,” Opt. Mater. 35(8), 1587–1594 (2013). P. Hlubina, M. Szpulak, D. Ciprian, T. Martynkien, and W. Urbanczyk, “Measurement of the group dispersion of the fundamental mode of holey fiber by white-light spectral interferometry,” Opt. Express 15(18), 11073–11081 (2007). J. Kirchhof, S. Unger, K.-F. Klein, and B. Knappe, “Diffusion behaviour of fluorine in silica glass,” J. Non-Cryst. Solids 181(3), 266–273 (1995). K. Lyytikainen, S. Huntington, A. Carter, P. McNamara, S. Fleming, J. Abramczyk, I. Kaplin, and G. Schötz, “Dopant diffusion during optical fibre drawing,” Opt. Express 12(6), 972–977 (2004). J. Goldstein, D. E. Newbury, D. C. Joy, C. E. Lyman, P. Echlin, E. Lifshin, L. Sawyer, and J. R. Michael, Scanning Electron Microscopy and X-ray Microanalysis: Third Edition (Springer 2003). A. I. Golovashkin and G. P. Motulevich, “Optical properties of lead in the visible and infrared spectral ranges,” Sov. Phys. J. Exp. Theor. Phys. 26, 881–887 (1968). Fig. 1 Schematic of an ideal PCF structure with a subwavelength inclusion in the core and with three rings of air-holes in the cladding. Fig. 2 The fundamental mode area as a function of the diameter of the inclusion for the numerically modelled fiber and the wavelength equal to 800 nm; In the inset, the relative intensity of the maximum (no inclusion) and minimum (inclusion diameter of 500 nm) fundamental mode area is shown. Fig. 3 Dispersion characteristics of photonic crystal fibers with the hexagonal lattice constant Λ = 1.8 μm and the relative air-hole size d/Λ = 0.91 with a high refractive index subwavelength inclusion in the core of the diameter in the range of 0–800 nm. Fig. 4 SEM images of the subpreform with the inclusion diameter of approximately 4.5 μm. Fig. 5 SEM images of the final fiber with the inclusion diameter of approximately 490 nm. Fig. 6 The attenuation characteristic of the developed fiber as a function of the wavelength. Fig. 7 Dispersion characteristics for the experimentally measured modes (dotted lines) and for the modelled fundamental modes for PCFs without an inclusion (ideal or based on SEM image), with a step-index inclusion of diameter equal to 400 nm and for the uniform model of diffusion. Fig. 8 The characteristics of the concentration of chemical elements along the core diameter of a) the subpreform and b) the final developed PCF. Fig. 9 Refractive index of glasses: SF6, NC21, the postulated glass, and of pure lead. Fig. 10 Dispersion as a function of wavelength for two measured modes (dotted lines) and for modelled modes on the basis of the postulated glass. Table 1 Measured thermo-physical properties of the SF6 and NC21 glasses. Measured thermo-physical properties of the SF6 and NC21 glasses.